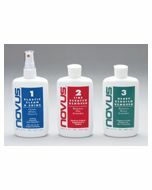 Novus 2 Polish (8 oz. bottle). There is no product better than Novus 2 to help remove small scratches to preserve the life and look of all your acrylic pieces. Simply place a few drops on the acrylic item and wipe clean with a soft, dry cloth.